Flowers sky blue (or partly violet) with 5 notched white bulges by the opening, ½” across [10–15 mm], in clusters that uncoil upward to lengthen; 5 corolla lobes spread flat from a tube; 5 hairy sepals; 5 very short stamens hide in the tube opening; round seeds in tidy clusters of 4; leaves pointed-elliptic, hairy underneath, on leafstalks from the lower half of stem, the blades up to 7″ long [18 cm]; mains stems hairless, 8–36″ tall [20–90 cm]. 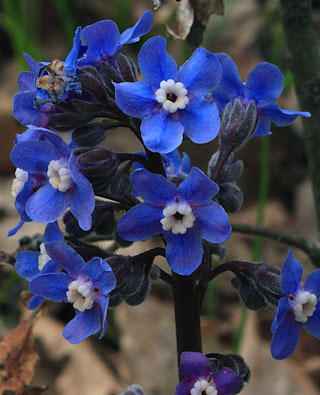 Habitat: Open woods at lower elevations, coastal, and eastward in the Columbia Gorge to Klickitat and Mosier; WA, OR. 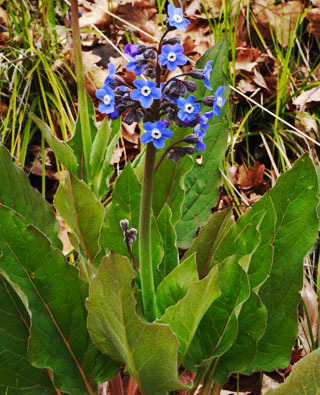 Similar: A widespread Forget-me-not, Myosotis asiatica, is smaller, with yellow or pink flower centers. Inland BC and AB have Northern Hound’s Tongue, C. boreale, with small cup-shaped flowers in slender racemes, and seeds in threes. The Common Hound’s Tongue, C. officinale, a widespread noxious roadside weed of European origin, is not easily confused with the others because its flowers are dark red or pink, cup-shaped, and stretched out in long one-sided racemes.